The late 80s and early 90s was a great time for metal in Houston. The Space City boasted some of the best bands in Texas and the Gulf South Region. One of those bands was ZLotZ. Comprised of guitarists Eric Halpern and Greg Gill, vocalist Tom Calandra, Bassist Shane Dubose and Drummer Van Eric Turner, the band was a mainstay on the Houston scene. Keyboardist Adam Rawlings later joined the fold and the band went on to amass a large regional following as well. 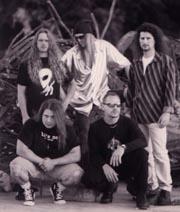 ZLotZ had the opportunity to open for several national acts like Firehouse and Dio. Their popularity garnered them attention from many promoters and they soon found themselves in the support slot for a majority of touring acts during those years. “For me, the most memorable national acts that we had the pleasure to play with were Dio, Tesla and Yngwie Malmsteen,” Calandra said. The band released two scorching albums, Tearing at Your Mind and Soul Existence, and both discs were distributed internationally and received outstanding reviews. The band later went back into the studio to generate 92, an EP of songs from their earlier days. But, as was the situation with many bands of that era, changes occurred. “We had a couple member changes early on and then a couple later on. After Tom left, it didn’t work trying to replace him,” Gill said. Gill later went on to join another local heavy hitter, Midnight Circus. Bassist Shane Dubose also left the band and was replaced later with band friend Joe Morgan, who filled the spot until the band went defunct. “For me personally, I left the band in 2003 when my wife was pregnant with my first son. It was definitely a very tough decision to say the least, since these guys were like my brothers for the last 10-12 years. But at the age of 37, it was time to focus more on my family, on being a new dad and on my career,” Calandra said. Much to the disappointment of local fans, the band decided to stop performing but there was always the hope that they would re-emerge. Over the past several years, band members have been quite visible in other projects. Calandra fronts a new act called Echo Temple and is making quite a dent in the local scene. Halpern spent time with Metal Blade recording artists Destiny’s End and more recently Sabbath Judas Sabbath with Helstar vocalist James Rivera, as well as performing with national artists Leatherwolf and Krucible and several local tribute acts. His newest project, Sworn to Silence, also features Rawlings and Mindcrime vocalist Chris Salinas. Dubose became highly involved with the Progpower Festival that takes place in Atlanta each year and put together a now defunct prog act called Cea Serin. Turner is now pounding the skins for Victim. Rawlings has been active with bands like Victim and is still working with Halpern. Gill left Texas entirely after Midnight Circus disbanded and is living in Missouri with his family while performing in a worship band at his church and conducting student ministry. What does the future hold for ZLotZ? Is there a possibility of more shows to feed the appetites of hungry Houston fans? “I would think it’s possible, depending on the timing and situation. Never say never!” Halpern said. 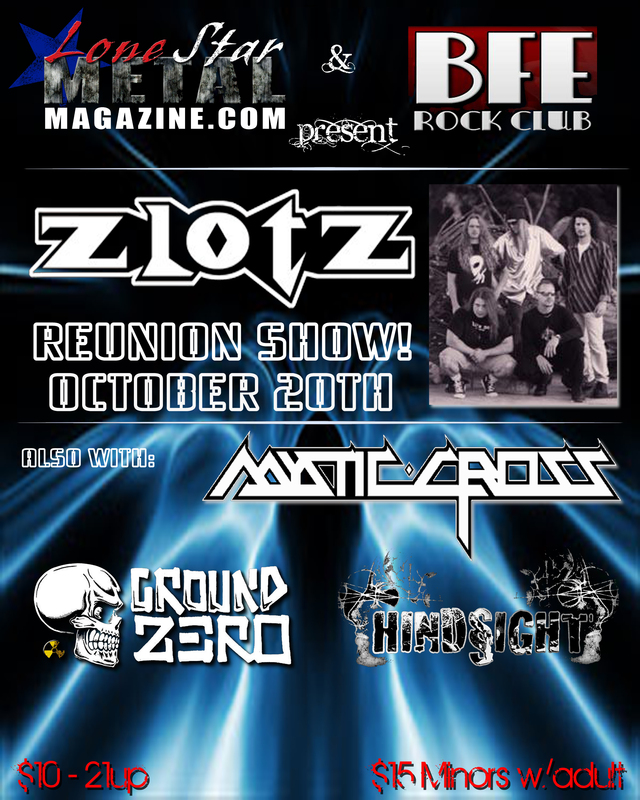 The band performs their highly anticipated reunion show on Saturday, October 20th, at BFE with special guests Ground Zero, Mystic Cross, and Hindsight. It is a show that is not to be missed!